I really wanted to like Korres Wild Rose Instant Brightening Eye Treatment ($45 at Sephora) because it sounds so good on paper. Not only is this eye cream from a reputable Greek brand specializing in natural skincare, the formula—which boasts wild rose oil, yeast, ruscus, and horse chestnut extract—promises to diminish dark circles, de-puff, and fight fine lines. In other words, it supposedly combats the three concerns I have about my undereye area, all while providing instant brightening benefits with its rose-gold toned brighteners. The eye treatment did indeed brighten and conceal dark circles instantly upon application, but that's the only good thing I can say about it. The needle-nose tube dispenses too much product no matter how lightly I squeeze it. The instructions say it should be applied to the under-eye area and one should take care to avoid the upper eyelid. Does this mean I need a separate eye cream just for my upper eyelids? Not a fan of that extra fussiness. Worst of all, the eye treatment stings my eyes no matter how careful I am to avoid the lashline and tear ducts. It stings so much, in fact, I had to wash my eyes with a gentle cleanser (ironically, the Korres Milk Proteins Foaming Face Cleanser that I reviewed and raved about here) the second time I used it. 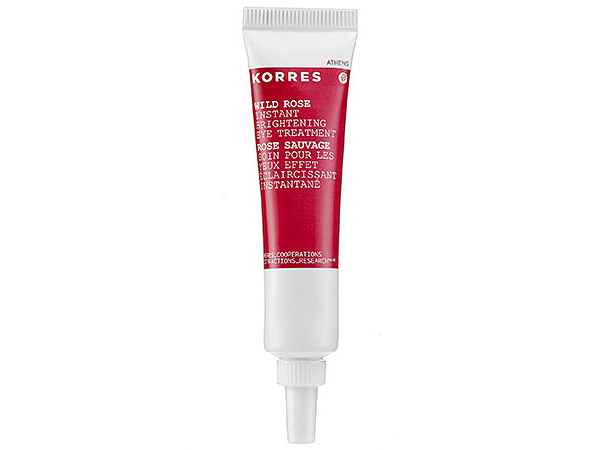 As much as I love Korres, I give the Wild Rose Instant Brightening Eye Treatment a definite pass. This eye cream was not one of my favourites.